They must unlock the mystery—before time runs out. 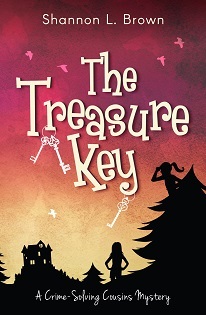 Unwrapping a puzzling package and finding a clue launches twelve-year-old cousins Sophie and Jessica into the dangers of The Treasure Key. They’re soon racing against time—and bad guys— to find long-lost treasure. Will they be the first to discover its hiding place? The Treasure Key is the second book in the Crime-Solving Cousins Mysteries. If you (or the eight- to ten-year-olds in your life) like Nancy Drew, Theodore Boone, or the Hardy Boys, then you’ll love Shannon L. Brown’s fun, fast-paced books for kids. Buy The Treasure Key and begin your search today. Jessica Ballow yawned and slouched into her chair. “We need something to do.” Pine Hill had become every bit as boring as she’d imagined when her parents first told her she was going to spend the summer in this small town in the mountains. On top of that, she had to stay with her cousin Sophie, whom she hadn’t seen since they were little. They got along well . . . now. Jessica groaned. “I know. The next couple of months might be b-o-r-i-n-g.” An endless summer of small-town life stretched in front of her. “Pine Hill was way more exciting than home for a while. It’s Tuesday, so most of a long week of nothing is in front of me. I’m ready to do something.” Sometimes Jessica wished she could be with her parents, but they were on the other side of the world because of her father’s job, and both she and her brother were spending the summer with relatives. Sophie got a faraway look in her brown eyes and sighed. “Oh, that would be amazing.” She opened the front door and stepped out. With one foot in midair, she froze. Sophie stepped to the side and pointed down. Right in front of her sat a perfectly gift-wrapped package. The wrapping paper had tiny pine trees on a white background and was encircled with a forest green ribbon and bow. “On the doorstep? I agree with your first thought: someone’s playing a joke on us.” Sophie reached for the envelope. “Let’s open it up.” She pulled on the end to tear it. “Good idea.” Sophie handed the letter opener to Jessica. She carefully inserted it in the end of the envelope and made a clean cut before tilting it and dumping out a key that hit the table with a clunk. They both stared at it. Jessica could tell Sophie was intrigued by the idea for a second. Then she set it down. At the edge of Pine Hill, Sophie yelled, “Race you!” and took off. Jessica ran after her. When she could see Main Street, Sophie was leaning against the brick front of Simpson’s Shoes. “Since we aren’t going hiking today, Cutoff Trail tomorrow?” Sophie looked so excited that Jessica didn’t have the heart to tell her no. Jessica pulled the envelope out of her purse and tipped the key into Sophie’s hand. “There is a real mystery.” She pointed to the front of the shop. The three walked together to where the desk sat. Jessica smoothed her hand over the curved cover. “The whole desk is beautiful.” She leaned to see the side. “I love the flower design on it.” Old furniture, dishes, lamps, even jewelry, filled Great Finds. But this desk seemed as though it had been around longer than most of the things her aunt had for sale. “Is it old?” she asked. Jessica pictured the problems that could come up. Sometimes Sophie had a way of finding trouble. Mrs. Sandoval raised one eyebrow. Mrs. Sandoval shook her head. “I’m not ready to try that again. I rarely close during the day, but this meeting is important.” She stepped out the door, and the girls followed her outside.